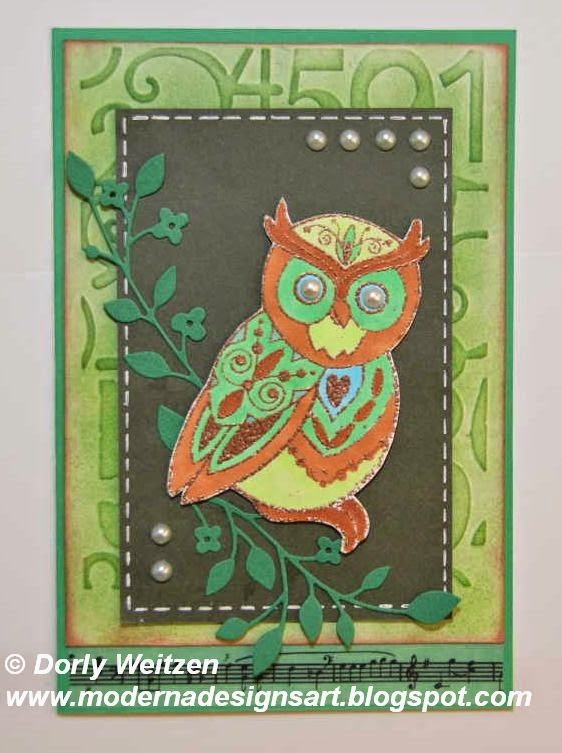 Here's another Michael Strong card in shades of green, using the Whimsical Owls stamp set. I colored the Owl using ProMarkers, and glued it 3D to add some dimension. The background was embossed with numbers, then colored and edged using Ranger Distress Inks. I framed the dark green CS with faux stitches, using a white gel pen. The leaves are a die cut. The pearls enhance the Owl's eyes and also draw the corners, and - of course - add some glam. I added Washi Tape with musical notes… will the Owl sing "Happy Birthday"? loving your owl! Great card. Very cute owl. I like the music staff beneath him. I imagine him singing a very soothing soft song. Also like how you tied in the rust colour with the edge of the border.